Oh how I love coming home from work to a phone call from the fraud department. I realize this is not world-ending stuff here, folks. People have their credit cards compromised all the time and have to go to their banks and deal with crap. I am not a unique butterfly and I don’t have to pay for the charges. But the control freak in me hates this kind of stuff. Deviations from my routine that don’t involve ogling cameras or lunch dates with lovely people or watching movies being filmed or eating copious amounts of baked goods go into the DO NOT LIKE category for me. You know, the category that includes pedicures and clowns and tea and traffic and eating things that swim and adding -ista to the end of things and people who don’t signal and people who don’t understand work bathroom etiquette and people who move too slowly in crowded places and oh my heavenly days that Bentley on the Bachelorette and the fact that Weeds in Canada doesn’t start until July and cilantro and back hair and people who stand too close to you in lines and people who don’t smile and my stupid cowlick and people who bring babies to movies. Lest you think I’m just all ranty right now, there *are* some things making me very happy and go into the LIKE VERY MUCH category, like the Canada Post strike being over so I can finally get my shorts delivered. (YES. I bought myself a pair of shorts. NO. I do not know who I am right now. And finally getting my best friend on Facebook. And spending evenings with her in our jammies just doing nothing. And finally figuring out how to check out FREE digital books from the library without having to deal with, you know, my library fear. And this spin brush that I am unreasonably excited to try. And getting an email from a celebrity that I loved in the 80s. And finishing two really great books in one week – The Invisible Bridge and When God Was a Rabbit. I could not recommend The Invisible Bridge enough to you. It was such a beautiful piece of historical fiction, with its love story sweeping across Hungary during the second world war. 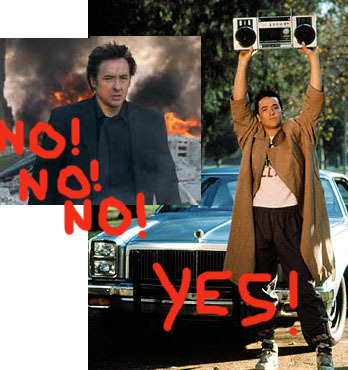 Like very much: Say Anything John Cusack. « Baby Names for Sale. I’ve had this happen with my Citicard FOUR times in the past year alone. And then when we returned from our road trip on Sunday, I had a nice letter waiting for me–dated, like, a month ago (really? you’re not going to at least give me the courtesy of a call??? )–saying their system was hacked, but don’t worry, just monitor your activity, because they didn’t get your password or social security number, only your address, email and card number. Oh geez, thanks! Way to relieve all my paranoia! I am about to change your life forever. Why do you have to wait for weeds to start in canada? it will take you to a page full of links for the said episode. i usually go with megavideo as the link. Then when Megavideo loads, you click on the red play button in the middle, it will load. then the red play button will turn green. once it’s green you can watch it. I would have gone crazy living in israel if i couldnt keep up with all my shows! I second this…I watched 3 seasons of Criminal Minds this way. I’m waiting anxiously for season 7 to be available. YES. but it DOES NOT WORK FOR WEEDS. Weeds is also available right now for free on sho.com. You’re welcome. Because my IP address is Canadian…I can’t even watch HULU. GRRRRR. Nothing is available in Canada…lol…so so sad!!! Because, um, they might be? Credit card companies never cease to amaze me. I had an account with 2 credit cards and one was used fraudulently. They replaced the card and then surprise surprise, the second card on the account was used fraudulently. When questioned they said both cards should have been cancelled but weren’t. I’ve taken my business elsewhere. “That’s all I could come up with” he grinned sheepishly. That is of course, unless it is at the expense of someone else. Micah raised an eyebrow and glanced over him, “That’s all I could come up with” he grinned sheepishly. Tex Mex place. A good place to explore and share all the gastronomic delights of India is the Khana Khazana website. rice milk, one without sugar as an additive.